If you’ve found the perfect pair of binoculars for your hunting trips but you’re still considering whether you need a case to carry them in or not, take my advice: you need one! Like many other things in life, binocular cases come in a wide variety and finding the perfect one will depend on more than just your budget. Factors such as durability, convenience and the level of protection needed should all be taken into account as well. 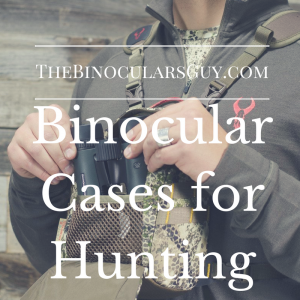 For your convenience, we’ve narrowed the endless list of binocular cases for hunting down to our top three choices that you can find below. 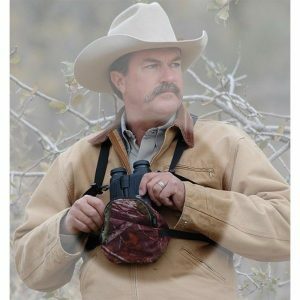 If you’re looking for a revolutionary way to carry those expensive hunting binoculars that you bought, then your search can stop at the Badlands Bino Case Mag. This camouflaged binocular case is perfect for use in the outdoors with its water resistant and dustproof magnetic no-zip closure that will keep your binos safe and secure no matter what weather conditions you face. The guys at Badlands not only had your binoculars in mind, but you as well. 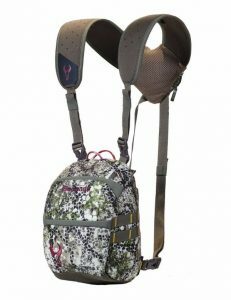 On top of the already great harness system that was designed with comfort and style as its core, they’ve added a rollout water reservoir pocket that can fit a 1L water bag to meet your hydration needs when out in the field. Safety, convenience and a little extra is all packed into this one binocular case. If this case falls into your desired budget, then there really is nothing more you can ask for! 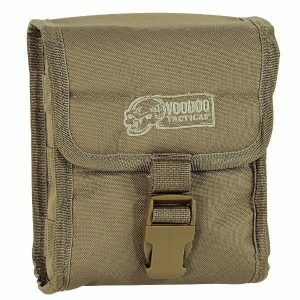 Voodoo Tactical Gear brings you a compact binocular case that allows you to carry your binoculars close to your body in an airtight casing. This protects your precious binos from any harm and ensures that the case is covered as well. Being in the field as often as you are you’ll know that protection from snagging and other obstacles are a must! What makes this binocular case stand out against the rest is its convertibility. Universal straps allow you to attach this case to a belt, vest or pack. This feature makes this binocular case very convenient as you get to choose between a range of styles to carry your binos in. You can adjust the straps to you desire in order to reach maximum comfort when out in the hunting field. Once you’ve found what works for you, you’ll never want another case to use when hunting! Bino Shield is a unique binocular case designed by Crooked Horn Outfitters. This binocular cased used when hunting will blend into your hunting area with its great camo print. The case was designed with convenience in mind and that is exactly what it is – convenient. You’ll be able to comfortably carry this case with you for a quick reach of your binoculars since it’s so compact and lightweight. Not feeling the burden of extra baggage while hunting is always a great benefit! The case is made from a strong outer shell and soft inner one. This combination protects your binos from the inside out. The outer covering prevents harshness from reaching your binos while the soft fleece inside of the case protects the whole device by being gentle when a knock is received. When secured in this case, you won’t have to worry about your binoculars getting harmed when crawling in harsh areas or facing rainy, snowy or dusty conditions. After seeing what each case can offer you I’m sure that you’ll agree that binocular cases for hunting is critical if you want to extend the life of your hunting accessory and make the whole experience of using a binocular more convenient for yourself. A good case will protect your binoculars while still being comfortable for you to carry around. Keeping all the important factors in mind is key to finding the right case. If you think we left a great binocular case out of our list, please let us know about it in the comments below!